Venerable Robina is funny, dynamic, affectionate, kind and outrageous. She will challenge you, make you think about your life, make you laugh and move your heart. Don’t miss this opportunity to hear her in person. 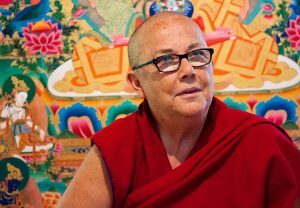 Ordained as a Buddhist nun for 35 years, Venerable Robina has edited many dharma books and the FPMT’s international Mandala magazine, featured in two movies, run the Liberation Prison Project, and tours the world inspiring others with her teachings from the heart. Use the links below to book and pay online to assure your place as we have limited capacity. Course fees cover the cost of bringing Venerable Robina to Perth and support our Centre. During these two evenings we will learn to understand and practice various meditation techniques, such as visualizing the buddhas, concentration meditation, analytical meditation, and meditation on the clear nature of our mind. We assume that love and attachment mean the same thing. But the Buddhist way of understanding our emotions is that attachment is the neurotic, needy, dissatisfied part of us that yearns for someone out there. Love, on the other hand, is referring to an altruistic part of our being – a connection with others, to wish that they be happy, and delight in their wellbeing. We have both of these but it’s so hard to see the difference. During these three evenings we will learn about the central points of Buddha’s worldview: impermanence, how we create and how to purify karma, bodhichitta, and emptiness and dependent arising. Click on one of the links below and complete the form.